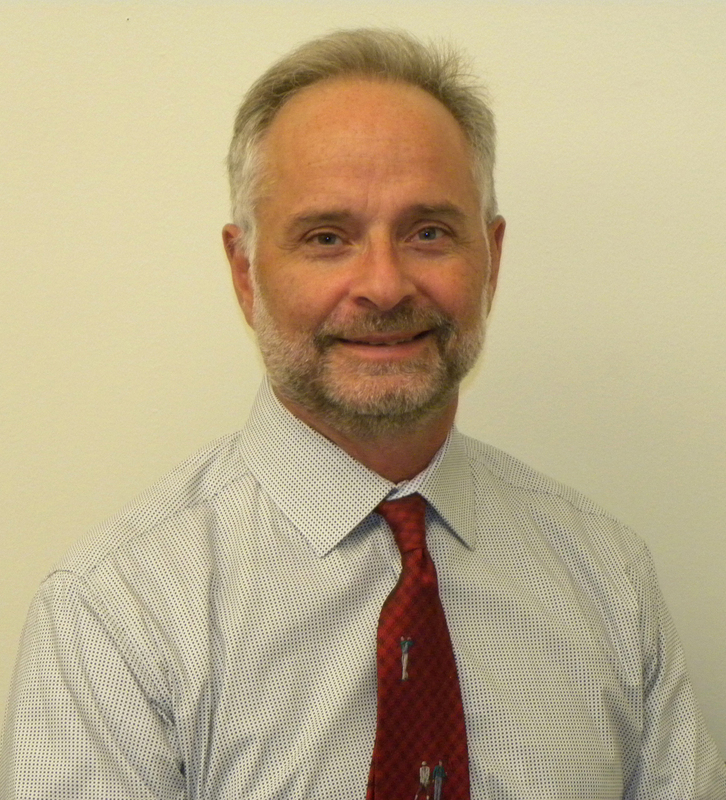 ​Jack Boulet, Ph.D., FAIMER Vice President for Research and Data Resources, was recently selected as a 2018 Fellow of the Society for Simulation in Healthcare (SSH) Academy. 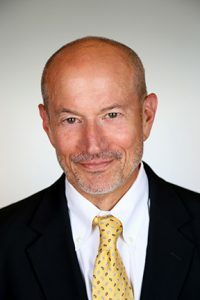 The vision of the SSH Academy is to assemble a community of recognized experts and thought leaders whose work promotes the advancement and transformation of simulation in healthcare globally. Fellows were selected based on their sustained, substantial contributions to the field of healthcare simulation, and will be formally inducted into the SSH Academy at the International Meeting on Simulation in Healthcare on January 13, 2018. An article about the evaluation and recognition of agencies that accredit medical education programs authored by FAIMER Research Scientist Marta van Zanten was recently published online by the journal Quality in Higher Education. Accreditation provides a level of legitimacy to medical education programs; however, the agencies responsible for accreditation may vary in their scope, governance, and the robustness and transparency of their decision-making processes. To enhance validity and comply with governmental and/or medical professional regulations, some agencies undergo external evaluations of their standards and protocols, a process commonly referred to as recognition. Dr. van Zanten’s article compares six European and United States-based recognition organizations that evaluate agencies that accredit medical education, highlighting similarities and differences in scope, processes, and consequences of review. The article, titled “Recognition organisations that evaluate agencies accrediting medical education programmes: Quis custodiet ipsos custodes?” was published on August 30, 2017. The first 50 people to access the article will receive a free download of the entire manuscript. 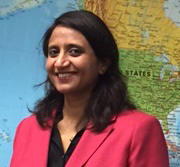 We are pleased to announce that Dr. Snigdha Mukherjee has joined FAIMER as our new Director of Evaluation. She comes to us from the Louisiana Public Health Institute (LPHI) where she was Associate Director for Scientific Integrity in the Division of Evaluation & Research. At LPHI, she was asked to conceptualize, plan, and implement evaluation activities for funded grants and contracts. She is a sociologist with expertise in survey research methodology, program evaluation theory, and methods as well as quantitative and qualitative techniques. Her postdoctoral training was in health behavior. Dr. Mukherjee has extensive experience in conceptualizing, planning and designing, fielding and managing projects, conducting data analysis, and writing reports and manuscripts for publication in research and evaluation. She has taught undergraduate and graduate courses and has mentored junior faculty and staff in program evaluation, research methods, and design. Dr. Mukherjee and her team will soon be looking at enhancing evaluation of FAIMER Education programs and The Network: Towards Unity for Health. One area we are exploring is in-depth case studies of some FAIMER projects. Dr. Mukherjee will be working with FAIMER Regional Institute directors to help identify possible projects. Please join us in congratulating Rashmi Vyas, M.B.B.S., M.D., M.H.P.E., on her promotion to Assistant Vice President (AVP) for Education at FAIMER. Dr. Vyas is a graduate of Christian Medical College at Ludhiana, India, and BJ Medical College in Ahmedabad, India (M.D. 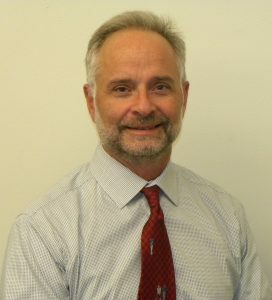 in Physiology), who became a FAIMER Fellow in 2003. After her Fellowship, her responsibilities in medical education as a faculty member at Christian Medical College at Vellore grew. She also became a regular faculty member at three of the FAIMER Regional Institutes in India, as well as at the FAIMER Institute in Philadelphia. During this period, Dr. Vyas matriculated at the University of Illinois at Chicago and completed her Masters in Health Professions Education. Her Masters thesis led to five publications in medical education. In 2014, Dr. Vyas joined FAIMER as Cross Cultural Communications Specialist, was later promoted to Associate Director for Regional Faculty Development, and recently to Co-Director of the FAIMER Institute. She would like to acknowledge the FAIMER Education team for their support, as well as the contributions of Page Morahan, Founding Co-Director Emerita of the FAIMER Institute, and Memoona Hasnain, past AVP for Education, whose work she will be building upon. 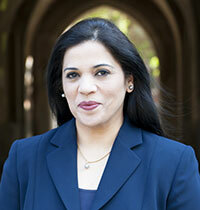 As AVP, Dr. Vyas will be involved with every aspect of FAIMER Education, with a particular focus on FAIMER Fellowships. An article about the World Directory of Medical Schools, coauthored by FAIMER Research Assistant Sarah Williams Leng and Barbora Hrabalová of the World Federation for Medical Education (WFME), was recently published on the European Consortium for Accreditation’s (ECA) online QAzette. To access the article, click here. The World Directory of Medical Schools (World Directory) was launched in April 2014 by WFME and FAIMER, as the result of a March 2012 agreement to merge the organizations’ respective directories—FAIMER’s International Medical Education Directory (IMED) and WFME’s Avicenna Directory—to produce a single comprehensive resource on undergraduate medical education worldwide. The World Directory is freely available at www.wdoms.org. Those interested can search for medical schools listed in the directory. In June 2016, WFME and FAIMER announced the launch of the World Directory Subscription Service. This service allows regulatory authorities, researchers, and other interested subscribers access to download a wealth of information from the World Directory for an annual fee. Available information includes medical schools’ years of operation, academic affiliations, and curriculum details. Data files are available for download in CSV or XML format and are updated daily. Questions and new listing requests may be sent to the World Directory staff at info@wdoms.org. We are pleased to announce that Memoona Hasnain, M.D., M.H.P.E., Ph.D., has joined FAIMER as Assistant Vice President for Education and Co-Director of the FAIMER Institute. Dr. Hasnain is responsible for overseeing the planning and implementing of educational methods and the educational research component of FAIMER education activities, including the FAIMER Institute, FAIMER Regional Institutes, and distance learning. Prior to joining FAIMER, Dr. Hasnain served as Associate Department Head for Faculty Development & Research and Associate Professor of Public Health and Medical Education in Family Medicine at the University of Illinois at Chicago (UIC) College of Medicine. The primary focus of Dr. Hasnain’s work is at the intersection of medicine and public health, with a special emphasis on interprofessional education, service, and research. Her work in health disparities and health professions education converges on developing leaders and scholars and finding effective ways to identify and address patient, provider, and system level barriers to the provision of high quality, patient-centered care for vulnerable populations. She is the principal architect of several educational innovations, including the UIC College of Medicine’s longitudinal “Patient-centered Medicine Scholars Program” and “Interprofessional Approaches to Health Disparities.” For the past 13 years, Dr. Hasnain developed and taught a course titled “International Women’s Health: Current and Emerging Issues” for Ph.D. and Masters students at the UIC School of Public Health. She is also past Chair of the Group on Faculty Development for the Society of Teachers of Family Medicine. Dr. Hasnain’s work has been consistently externally funded and published in peer reviewed journals. She is a reviewer for federal grants and several scientific journals. Dr. Hasnain has received numerous accolades for her research and teaching, including the Teaching Recognition Award by the UIC Council for Excellence in Teaching and Learning, the Health Policy and Administration Distinguished Alumni Achievement Award from the UIC School of Public Health, and the Susan La Flesche Picotte, M.D. 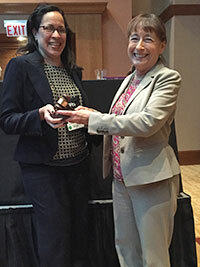 Health Equity Pioneer Award from the UIC College of Medicine. She is also a recipient of the prestigious Macy Faculty Scholars Award by the Josiah Macy Jr Foundation. This award is given to select educators nationally to accelerate needed reforms in health professions education to accommodate the dramatic changes occurring in medical practice and health care delivery. Dr. Hasnain received her medical degree from Dow Medical College, Karachi, Pakistan and trained as an Obstetrician-Gynecologist. She served as a Medical Educationist in the Department of Medical Education at the College of Physicians and Surgeons, Pakistan, a World Health Organization Center for Health Professions Education. She earned a Masters in Health Professions Education and Doctorate in Public Health Sciences from UIC. She is a trained mediator and Healer’s Art faculty. Please join us in welcoming Dr. Hasnain to FAIMER. 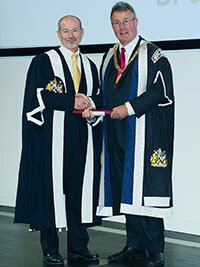 FAIMER President and CEO John Norcini, Ph.D., was honored to receive an Honorary Fellowship of the Royal College of General Practitioners (RCGP) on May 15, 2015. The RCGP is the professional membership body and guardian of standards for family doctors in the United Kingdom, which works to promote excellence in primary health care. Fellowship is the highest level of membership granted by the RCGP, and is awarded in recognition of a significant contribution to medicine—particularly general practice/family medicine. FAIMER Research Scientist Marta van Zanten, Ph.D., and N. Lynn Eckhert, M.D., Dr.P.H., of Partners HealthCare International, recently coauthored a Perspective piece for the New England Journal of Medicine, titled “U.S.-Citizen International Medical Graduates—A Boon for the Workforce?” Nearly 14% of applicants for residency positions in the United States are U.S.-citizen graduates of international medical schools (USIMGs), who are more likely to enter primary care fields compared to graduates of U.S. medical schools. The large majority of USIMGs graduated from medical schools located in the Caribbean region. In this Perspective, the authors describe data available on these international medical schools, and outline some of the issues related to Caribbean USIMGs and their contribution to the U.S. physician workforce. The Perspective appeared in the April 30, 2015 issue (Vol. 372 No. 18) of the NEJM. The 12 divisions of AERA are organized to represent major scholarly or scientific areas within education research that add to the field and the Association as determined by the AERA Council. Division I focuses on the context and conduct of scientific studies that address education in professional practice disciplines, including medicine, pharmacy, dentistry, and nursing. The Division has a long history with AERA, from its beginning as a special interest group for health professions educators in 1971 to its divisional status approval in 1978. As Vice President, Danette will represent the interests of Division I members as she serves as a member of the AERA Council. Her tenure as Vice President over the next three or more years will serve to increase the visibility, both nationally and internationally, of FAIMER and the Educational Commission for Foreign Medical Graduates (ECFMG) in the professional community.